I’ve just found your web site, helped by information from Tristan at the FTW office. 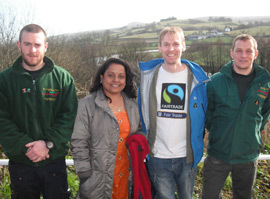 The Monmouthshire FT County Group is in the early stages of creating a Monmouthshire Fair Trade Way linking the four fair trade towns, Chepstow, Monmouth, Abergavenny and Usk. The way will follow the already well waymarked Wye Valley and Usk Valley ways. We will need to describe routes filling in the links from Monmouth to Abergavenny and Usk to Chepstow. It will also be promoted as a cycle route. Once we have more content on the web site, we will start using it to help promote use of fair trade products by cafes and b&bs on the route.